Soooo excited for my 12 days of giveaways! #mtbcHoliday I will be posting a new giveaway video for the first 12 days of December…items for the home, for mommy, for baby and for kids. Be sure to check back everyday to enter and I will be selecting a winner within 2 days after each giveaway and announcing it on my snapchat (and will message/email the winner too). Day 7 is for Yookidoo developmental toys and bath toys! 1 lucky winner will win the Yookidoo Gymotion Activity Playland and the Yookidoo Submarine Spray Station. Rules and details to enter through Rafflecopter below or click here. 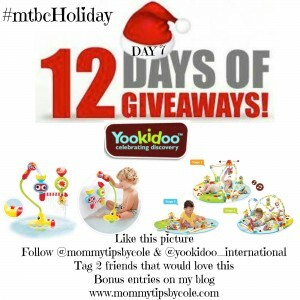 8 Responses to "Yookidoo Developmental Toys & Bath Toys| 12 DAYS OF GIVEAWAYS: Day 7 | #mtbcHoliday"
Hi! My (only) little boy is going on 4 months so something like this would be great for us. He has 3 older sisters, so whatever we had/have is girly. But they adore him! We love your channel btw. This would be an awesome gift for my 6 month old nephew. He’d be able to grow with it. The bath toys really look fun and entertaining for little ones, I’d love to see how my lil one would do with them as she grows. What awesome toys!! I’ve never heard of this brand and am completely in love now!! Going to browse the site now!! !